A cooling Tower is generally used to transfer the heat from certain waste products into the atmosphere. These towers are a signature of nuclear power plants though many other industrial sectors also see its implementation on regular basis. On a broader scale, these towers can be used in almost all sectors where there is a need to radiate the heat of the waste materials into the atmosphere. These towers either use a cooler fluid for this purpose or only air to cool the waste products. However, these towers need to be installed and maintained properly in order to keep the whole system in good shape. Manufacturers who are involved in manufacturing and installation of these towers are managed by expert professionals with many years of experience in the industry. Smaller and less complicated cooling towers are used in the air-conditioning, ventilation and heating set up of buildings. These towers radiate the heat of the waste from a chiller. This can be done either with the help of water or with the help of dry air. However, water based Chilling Plants are more efficient and cost effective than air chillers as heat can be more easily rejected through water than through air. Office buildings, schools, shopping malls and other places that require a sound air conditioning employ these towers as a part of the central air conditioning system. 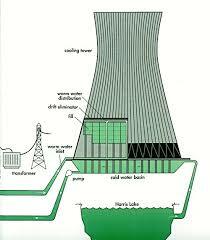 The industrial use of a cooling Tower is mainly found in power plants. Nuclear power plants are known for their gigantic towers that look like chimneys from a distance. At the base of these towers a steady flow of cold water is maintained that reduces the heat of the fumes before they are exhaled in the air. Thermal power stations also make use of these towers to reject the heat on a rapid pace. It is to be kept in mind that specially trained professionals should be appointed to maintain the quality of these towers as any minor failure may lead to some catastrophic industrial disaster. There are mainly two types of towers— package type and field erected type. The package type process allows the parts of the tower to be pre fabricated and preassembled. The whole setup can be shifted from one place to another on the back of the trucks and are hence largely preferred by those who have smaller heat rejection mechanism requirements. The field erected type is a much larger form and needs to be constructed on the site. Their heat rejection capacity is much higher than the package type towers and is perfect for industrial uses as in power plants and oil refineries. Cooling Tower Manufacturers generally specialize in both the systems, but it is always better to check their experience if clients need a field erected type of tower. Buying a cooling Tower requires enough consultation with experts because there is no room for compromising with the quality. Clients can go through the websites of the manufacturers in order to know what they provide at what price.